Blessed day: St Mary of the Cross. 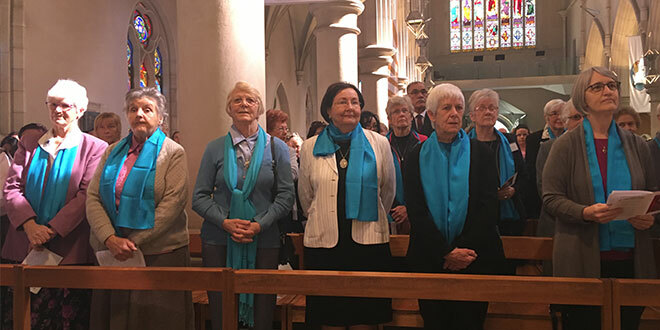 Great feast: Sisters of St Joseph at the Mass in St Stephen’s Cathedral celebrating the feast of their co-founder St Mary of the Cross MacKillop. AUSTRALIA’S first canonised saint was a pilgrim who has drawn millions of Catholics with her on her journey, Brisbane Archbishop Mark Coleridge said. In a homily to a packed St Stephen’s Cathedral, Archbishop Coleridge, said St Mary of the Cross MacKillop was a daughter of this land, but a saint for the whole world. “There was some profoundly radiant humanity about Mary MacKillop,” he said. Archbishop Coleridge shared these words on the Solemnity of Saint Mary of the Cross MacKillop on August 8. This year also celebrates the 150th anniversary of the Sisters of St Joseph which Mary MacKillop co-founded. Moments before the Mass, Archbishop Coleridge blessed the new Mary MacKillop Walk which he said during his homily, will be “an enduring memorial to the patron of the archdiocese”. “Like her it is very simple. But like her it will be enduringly eloquent and will speak of this woman who is so unmistakably and unforgettably one of us,” he said. The new walk leads from the Penola Place through the St Stephen’s Cathedral precinct telling the story of her extraordinary journey “from Melbourne to Heaven”. 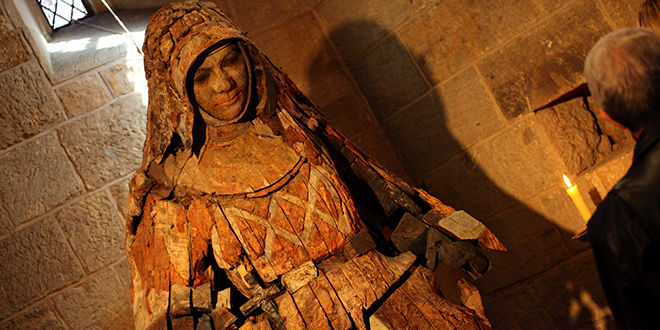 “The walk leads into the cathedral where she prayed and worshipped and where I think the finest image of her stands, hewn out of the wood of the Australian bush – stuff which is of us, to represent the woman who is one of us,” he said. “The God of our faith is a God of the journey. This was absolutely true of St Mary of the Cross MacKillop. Inscribed on her tomb in North Sydney are words of her own: ‘We are but travellers here’. How true, and how true of her. She was a spectacular traveller. She journeyed all over this vast continent,” he said. Archbishop Coleridge said to understand Mary MacKillop one must understand her suffering. “She suffered in this city. She suffered in all kinds of ways throughout this land, and yet her suffering was the cross of Christ, not some other cross, because you see this world knows many, many crosses and all but one of those crosses destroys the human being, turns us into the living dead,” he said. “Mary MacKillop would be just beaming to hear and see and listen to the music, the pray of thanksgiving in this wonderful place today,” she said. “I’m sure when Mary MacKillop trod the streets of Brisbane she was certainly listening to the heartbeat of her God and the heartbeat of the world around her, and I wonder what she would make of this place today. “I’m sure she s thrilled. I’m sure she would be really pleased to see the new Mary MacKillop Walkway, not because it’s about her, but because it is a pathway to God, to the God whose heartbeat we are all called to be in tune with. Brisbane Catholic Education executive director Pam Betts praised Mary MacKillop and “the work of her order, the much-loved Joey’s” who set up schools, particularly where those who were poor and isolated could find a pathway in life. “It is most fitting that our vocal accompaniment this morning has been provided by a combined choir of 200 students from our schools… ” Ms Betts said. A choir and a full band of musicians from Catholic schools across South East Queensland was conducted by Anthony Young. “The Mary MacKillop Walk will be a wonderful place of reflection and contemplation for all who visit this precinct, especially groups of students from our schools who frequently come here,” Ms Betts said.